How do we get the best out of our students? By building a rapport with them. We hear that over and over again, but do we really know what that looks like or what that means? It’s not about preaching to them or trying to make them better people. It’s about learning who they are, accepting and celebrating their uniqueness, and really listening to them. 1. Stand in the hall between classes. Take a little break to chat with students as they pass by. Smile, say hi, comment on that cute new haircut. Make yourself actually notice the kids. I know it seems like you could get work done at your desk, but really, what can you accomplish in that three minutes? Standing in the hall outside your door allows you to be seen and chat with students as they walk by. You’ll always find that one tough nut, but I bet if you keep at it, they will greet you before the year is over. Standing in the hall also lets you welcome your kids to your room every day, and it’s wonderful for them to enter a place where someone is glad to see them. This is also the first step in making your class a safe and welcoming place. Don’t stand for bullying or belittling of anyone for any reason. Don’t do it yourself, and stop it if you see it. 2. Advise a club or open your room for study sessions. Coaching a sport is one way to interact with students outside of class, but it’s far from the only way. If there aren’t any clubs in need of an advisor, ask your students if there’s anything they want and propose a new club. Or just host an informal book club with interested students. I’m an early bird, so I open my room up for students before the school day to work on a computer, print things out, or do whatever they need. I’m already there, so why not? 3. Go to school events if possible, but try to see students outside of class. The kids will love to see you at their games. I set a goal to go to one event for each sport. Even if I can’t stay the whole time, the students appreciate that I came out. Plus, when I say, “Hey, nice hustle last night,” they know I actually saw it. You also have students who don’t participate in sports but may be in 4H or ride a skateboard—try to see these students in their element. I’m deathly afraid of birds and my students know it, so the look on a student’s face when I came to his poultry show at our local fair was worth the blood I drew squeezing my husband’s arm. A lot of the time—as with that fair—I was going to go anyway. But you can also stop at McDonald’s and buy a coffee if that’s where a student works. And if you can’t make it to events outside of school, just asking how they went will let the students know that you think of them as people beyond their academic work. 4. Pay attention to and respect their nonverbal behavior. Students are entitled to their personal space just like you are. If they keep their arm over their work or move away from you as you walk by, respect that and don’t take it personally. If they don’t want you to look over their shoulder, don’t. Try asking them to show you what they’re working on. 5. Always, always look for the good in them. I start each year with a notebook that I carry to every meeting and always have on my desk. It’s my lifeline for the year. I fill it with ideas, due dates, etc., but most importantly, a few weeks into the year I make a list of students who I believe have had little or no positive communication from the school. I look up their addresses and phone numbers so I have them ready. 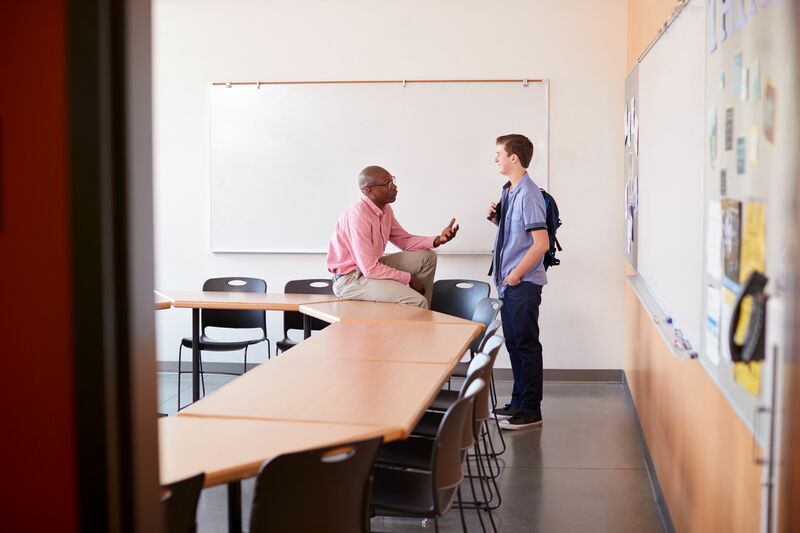 I don’t ignore the “good” kids—it’s easy to see their accomplishments, and I contact their homes as well, but I make myself look for something positive in the students who haven’t had the best school experiences. 6. Last of all, be sincere. Teenagers can spot a phony from miles away. You became a teacher because you have a passion for your subject area and a passion for young people. Let them know that however you can.